so today is the first day of advent and you know what? no calendar action happening at our house. that's not to say that we won't still be doing an activity every day anyway (christmas book today) or that i won't somehow pull a calendar together in the next few days but i got myself all muddled up in design ideas and missed the official start date. the other thing holding me back is i'm not sure how the three year old is going to take the whole thing anyway. she's going through a particularly questioning and argumentative stage and i can just see every advent opening as an invitation for a litany of "i want to do it NOW"s and "let's open another one, mommy"s and really, i have enough things to repeatedly explain to her all day. so i may just stick to the fun activities and let myself off the advent hook until next year when she'll be better able to grasp the whole countdown thing. or maybe we'll just count down the last seven days before christmas this year and see how that goes. and in another epic mommy-fail, we tried to make crayons yesterday. you know, the ones you see all over the internet? 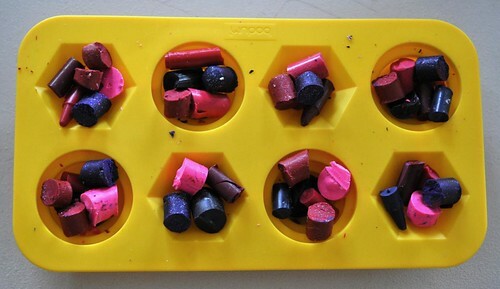 where you take broken up crayons and put them in a silicon mold and then into the oven or microwave or outside in the hot sun? and they melt and then cool and you have these really cool shaped, like-new crayons? yeah, well. it started off well. my mold said it was okay to freeze or put in the oven or the microwave so that was all good. i contemplated microwaving them but worried about exploding crayon splatters and we had the oven on anyway as we were going to make cookies so opted for the oven. put the mold in, watched it melt, all happy and good. then it came time to take them out and i realised my error. 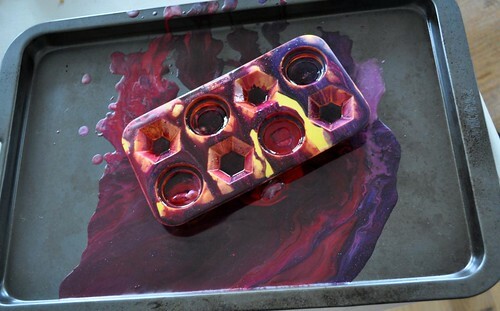 flexible silicon mold full of molten crayon = very hard to remove from oven. i should have just let it cool in there but, you know, i had a three year old begging to make cookies so i tried to slowly pull the mold out onto a tray and well, you see the result above. still struggling with the concept of only opening one window/box per day here as well! I learnt my lesson a few years back and now I only actually fill one box at a time so even if people get over eager and start opening more there is nothing inside!! Bummer about the crayon fail - that is so something I would do!!! about the crayons, they look pretty when they are done but they draw very ugly if you have any dark color in them, they just overpower everything, now instead of bits of crayon kicking around I have a bunch of "never" touched melted ones instead. good to know! if i get up the courage to try it again, maybe i'll just make single colour ones instead. I didn't get around to making a calendar in time this year either, so I'm going to work on making it as an advent project and then it will be ready for next year. I think Ali would treat it as some kind of punishment if we did it instead of a chocolate calendar, anyway. Totally with you re the advent calendar. My three year old will want to open every door on day 1 and he's already razzed up enough about Christmas and I am exhausted from picking my battles. I saved up all my toilet rolls and had lots of exciting plans, now I'm just happy I didn't stress about it all. Great post. I was feeling slack about not getting an advent calendar together this year as I had intended but think it probably was for the best. Next year the older two will be 4+ and will hopefully "get" the opening only one each day. I think we would have been headed for meltdowns if we did it this year. So I guess it's lucky I was so disorganized this year. Thanks for the heads up about the crayons, too. That has been on our to-do list and I can just imagine spilling hot melted canyon all over the floor. Will remember to let it cool in the oven. i've never been brave enough to try the crayon making thing..thanks for sharing your attempt, it's refreshing to see things GO WRONG instead of pretty pictures of perfectness like some other crafty blogs consistently present! i did manage to make an advent calendar this year (a very simple one) but we also have 2 el cheapo choccie ones....the 4 year old did ok just opening ONE window up with little moaning whilst the 2 year old opened TWO up....meanwhile the homemade one still sits with 'day one' treats inside the first pocket unnoticed! double surprise today i guess. I love this post too! Made me laugh, we seem to have so many afternoons where things go wrong like this. My 3 year old is OK with the advent calender thing, and I have only filled one pocket at a time which helps I think. But all the questioning and the NOW!'s? We have that all day long too!